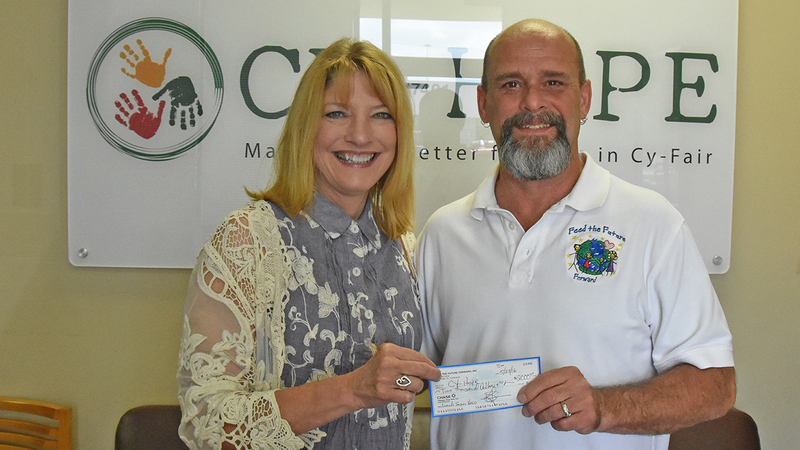 Lynda Zelenka, executive director of Cy-Hope, accepts a $2,000 check from Feed the Future Forward's Kenny Thompson to help fund the Lunch Super Hero program in CFISD. HOUSTON (KTRK) -- A little more than two years after partnering with Cy-Hope and the CFISD food service department to launch the Lunch Super Hero program for district students, Feed the Future Forward founder Kenny Thompson delivered a $2,000 check to Cy-Hope on Monday to help keep the fund replenished. Thompson, Cy-Hope and the food service team collaborated on the Lunch Super Hero account to dissolve the alternative lunch program and ensure no student goes without a hot meal. "I'm totally excited that Cy-Fair still has the lunch program that we can donate to care for these students," said Thompson, who gained a citywide reputation as the "Lunch Angel." "I want to stay focused on making these donations to these districts allowing us to keep these kids fed and have these impacts." Thompson, who has launched similar funds at neighboring districts, has contributed a total of $4,000 to Cy-Hope for the fund in 2015-2016. "Cy-Hope appreciates Kenny's faithfulness in supporting CFISD through Cy-Hope," said Lynda Zelenka, Cy-Hope executive director. "He routinely provides funding for the Lunch Super Hero program and we are thankful for the partnership in making life better for all the students in Cy-Fair!" According to Darin Crawford, food service director, the Lunch Super Hero account is used every day in CFISD to support students in need. It has been used by every district campus and has received more than $30,000 in contributions for the current year. Thompson said he looks forward to making a larger impact for the fund in 2016-2017. "As the foundation grows, more corporate citizens are getting involved as well as private," he said. "My bank account is steadily growing, and having a major impact is what we set out to do. "Early on I thought we'd be a flash in the pan. I thought we'd donate for so long and people may lose interest. But hunger and poverty are big issues in our city, and I think it hits home with a lot of people when kids are affected. Having these programs with Cy-Hope, etc., make a big difference. As long as these programs are still in place, we're going to keep donating. Bigger and better every year." Donate to the Lunch Super Hero account through the Cy-Hope website.